Chasing Ice Trailer from milkhaus on Vimeo. To celebrate the Mayan apocalypse in proper fashion, last night we went to see Chasing Ice, the new documentary movie about acclaimed photographer James Balog and his monumental efforts to document the receding glaciers of Greenland and Alaska. Anybody with their head out of the sand can clearly understand that our planet is in turmoil; nevertheless, it is still utterly shocking and sobering to actually SEE through Balog’s cameras and time-lapses how rapidly these enormous glaciers and ice sheets are melting away. We are witnessing a planetary transformation of stunning speed and scale, and it’s difficult to imagine “smooth sailing” for our civilization in the coming decades. How many wake-up-calls do we need as a society to realize that we need to get our sh-t together and move forward with more sustainable energy policies?! I encourage you to go see this movie as soon as possible. Go SEE how our Earth is transforming while we all go about business as usual. Go SEE for yourself. Posted in Environment, Inspiration, Videos on December 22, 2012 December 22, 2012 by Jack Brauer. Posted in Environment, Videos and tagged Canada on February 21, 2012 October 10, 2016 by Jack Brauer. Dave Showalter is an accomplished nature, wildlife, and conservation photographer. His dedication and relentless efforts shine through on his must-read blog Western Wild, which is full of inspiring photos and informative text. I recently asked Dave a few questions about his photography and his conservation efforts. 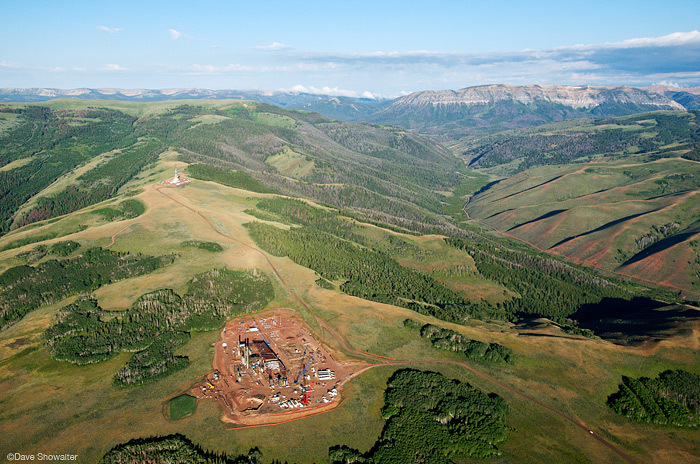 Aerial view of gas development on Riley Ridge, southern Wyoming Range – Imagine this scene with 136 wells, storage, roads… Photo by Dave Showalter. You’ve worked on a wide range of conservation fronts, most recently involving the Greater Yellowstone Ecosystem. Can you explain in a nutshell what this project is about? How and why did you become involved with this particular conservation effort? I was contacted by Barbara Cozzens, NW Director of the Greater Yellowstone Coalition about their campaign to protect wild areas along the Absaroka-Beartooth Front. Barb understands the value of advocacy-driven photography and we agreed to develop a project with the support of the International League of Conservation Photographers (ILCP). It’s called a “Tripods In The Mud” (TIM) where the three legs of the tripod signify the partnership of the conservation group, the photographer, and ILCP. The Absaroka Front TIM is a big step for any conservation group, and GYC deserves a lot of credit for thinking outside the box and partnering with ILCP. It speaks to their commitment to the Greater Yellowstone Ecosystem (GYE). We planned three photo expeditions in August, September, and November and I covered an enormous amount of territory in Cody Country. The A-B Front forms the eastern boundary of Yellowstone, is often called “Yellowstone’s Wild Side” and includes a bewildering amount of truly wild country, the Shoshone, Clark’s Fork and Greybull Rivers, and important migratory and winter habitat for a lot of Yellowstone wildlife. The recreation and sportsmen opportunities, and associated revenue are enormous. It’s easily the wildest and most important landscape in the West, and it’s all threatened by oil and gas drilling, fracking. Our job is to illustrate why this land is so important to the GYE, steer energy development to more appropriate “brown field” areas, and get the A-B Front protected by convincing land managers and local politicians that it’s the right thing to do long-term. The timing is critical too, with both the Shoshone National Forest and the BLM drafting their 20-year land management plans right now. Posted in Articles, Environment and tagged Wyoming on February 8, 2012 June 7, 2013 by Jack Brauer. 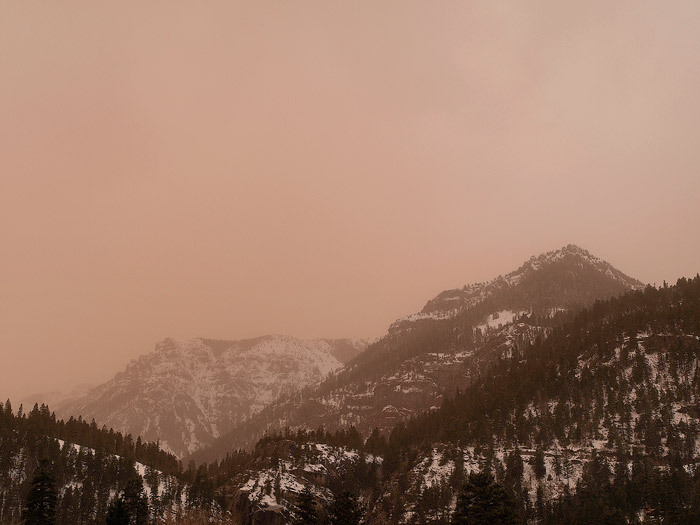 Last spring I wrote a post about the snowpack dust pollution that is becoming so common every year in Colorado. As far as I can tell, it’s getting worse and worse. In the last few weeks, we’ve had a good set of storms coming through, bringing much welcome snow to the mountains. Unfortunately, along with the snow has come wave after wave of dust. Today I noticed an eerie orangish glow from outside, and looking out the window I saw what could easily be mistaken for wildfire smoke. Brown dust-filled clouds are currently streaming in over the mountains. I have never seen anything like this before. It is utterly disgusting. The photo above was taken around 4pm today; the brown color is the color of the clouds – not sunset, not smoke, just clouds full of dirt. 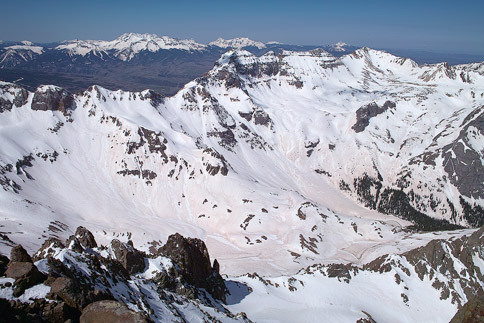 Yet again we can kiss goodbye any chance of a prolonged spring skiing season, as the dust will surely wreak havoc on the late-season sun-baked snowpack. Posted in Colorado, Environment and tagged Colorado, San Juans on April 3, 2009 May 19, 2013 by Jack Brauer. Today I hiked and snowboarded down Mt. Sneffels (see the riding photos in the next post). Here’s the classic view looking from the summit into Blue Lakes Basin. Notice all the ugly brown snow? When it’s windy in the western states, dust blows from the deserts and ends up smothering the mountains. It’s a phenomenon that has probably happened naturally through the ages, but has become much worse in recent decades due in part to large scale grazing which erodes the desert soils. I’ve even heard that some of the dust blows all the way across the Pacific from huge dust storms in China! In any case, the dust has a terrible effect not only on the snowpack but on the entire watershed. The dark dust absorbs much more solar radiation than pure white snow, causing a rapid meltdown of the snowpack. In heavy snow years like this year, it could cause flooding problems. In light snow years, it can cause premature meltdown, leading to drought conditions during the summer. 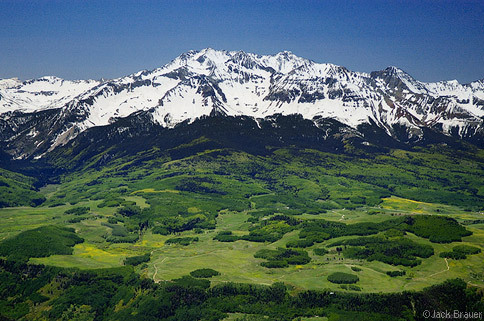 Posted in Articles, Colorado, Environment and tagged Colorado, San Juans on May 29, 2008 May 1, 2015 by Jack Brauer. I am pleased that the Trust for Public Land recently published a magazine article about Wilson Peak featuring one of my photos of this iconic mountain near Telluride. I am even more pleased that access to Wilson Peak has been secured by the Trust for Public Land after years of being blocked by a Texan developer. Wilson Peak is one of Colorado’s most beautiful and most recognized peaks, and in 2007 a Texan real estate developer who owned some mining claims below the mountain closed access to the standard hiking route (all other routes involve much more dangerous mountaineering). After negotiations with the National Forest Service made no progress, The Trust for Public Land stepped in and was able to purchase critical portions of the property in order to reopen and protect public access. You can read the online version of the article here. Posted in Colorado, Environment, Publication and tagged 14ers, Colorado, San Juans on May 14, 2008 November 10, 2013 by Jack Brauer.